Hamster Euthanasia means deliberately bringing about the death of a hamster. It is also sometimes called 'putting to sleep' or 'putting down'. It may be the hardest decision ever made by a hamster owner. The most important factor when considering hamster euthanasia is, whether your hamster is suffering and whether this suffering can be effectively relieved. The nature and outcome of the illness and the age of the pet must also be taken into consideration. 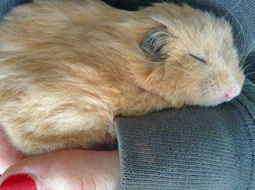 Many sick hamsters today can be treated by either medication or surgery, but unfortunately there are other incurable diseases or suffering due to old age and sometimes euthanasia may be the kindest way. Should euthanasia be requested just because the hamster is unwanted or that member of the household has an allergy to him/her, then one must opt for alternatives to euthanasia and give the hamster up for adoption instead. The process of hamster euthanasia is essentially painless, often there is only the tiny prick of the injection. Remember, no matter what, all animals that are put to sleep should be treated with respect and dignity. Euthanasia is usually via an overdoes of a general anesthetic administered either as a sweet gas to breathe or a painless injection of a liquid anesthetic. The whole procedure should be kept as quiet and stress free as possible to reduce upset to both hamster and owner. The anesthetic causes the breathing to cease and heart to slow down and eventually stop. Euthanasia should only be carried out by a vet surgeon.